(DES MOINES) - Michigan coach John Beilein didn't need to worry after all. 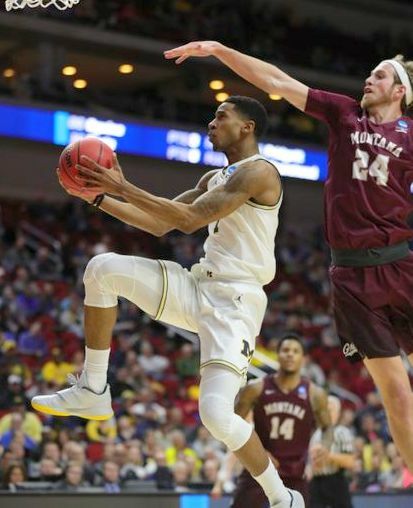 Four days after his Wolverines' disappointing loss in the Big Ten Tournament championship game, they did exactly what they were supposed to against 15th-seeded Montana in the first round of the NCAA Tournament. They got off to a fast start, led by double digits quickly and went on to a 74-55 win Thursday night. Charles Matthews had 22 points and 10 rebounds in his best performance since coming back from injury. Ignas Brazdeikis added 14 points and seven rebounds, and Jon Teske had 11 points and nine boards for the Wolverines, who led by as many as 27 points in the second half. Sayeed Pridgett had 17 points for Montana (26-9). The Grizzlies' 33-percent shooting from the field was their second-worst of the season. Montana missed 13 of its first 16 shots and trailed by 13 points 10 minutes into the game. The start was in stark contrast to last year when these teams met in the first round. The Grizzlies scored the game's first 10 points before giving way and losing 61-47. The Wolverines (29-6) are in the round of 32 for the third straight year. They'll play Florida on Saturday.